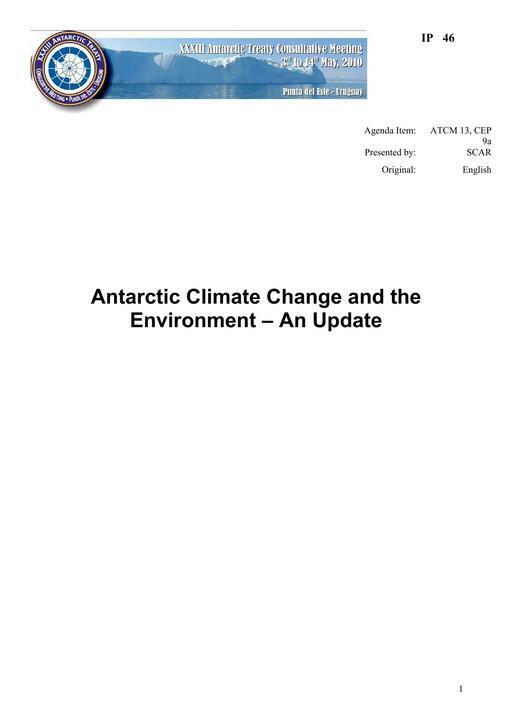 The SCAR Antarctic Climate Change and the Environment (ACCE) report was a major initiative to review the climatic changes that had taken place on the continent and across the Southern Ocean, and to consider the possible impact on the biota and other aspects of the environment. It examined changes on the geological time scale and through the instrumental period of the last 50 years, and considered how the Antarctic climate and environment might evolve over the next century under a range of greenhouse gas emission scenarios. The report was published online ahead of the COP-15 meeting in December 2009 and launched to the media at the Science Media Centre in London on 30 November. It was well received and generated significant attention worldwide, with the editors appearing on TV and radio programs, and conducting interviews with journalists. However, Antarctic science is advancing at a very rapid rate and SCAR has always intended to develop a means of maintaining the momentum of the ACCE initiative. SCAR will prepare periodic updates to the report that highlight new advances in our knowledge of Antarctic climate science. As the ACCE report was published quite recently, this paper considers some key questions that climate and other environmental scientists are concerned with. See also Resolution 4 (2010) and Decision 5 (2010) in relation to the SCAR Antarctic Climate Change and the Environment Report ( pdf Attachment (90 KB) ).